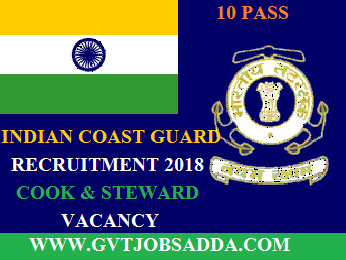 Indian Coast Guard has published the job notification in navik domestic branch for the post of cook & steward various post, Those candidates who are interested in Indian Coast Guard (DB) They can read notification carefully and apply before last date of apply online.brief information mention below. as on 01 Apr 2019i.e. born between 01 Apr1997 to 31Mar 2001, both dates are inclusive. (Upper age relaxation of 5 years for SC/ST and 3 years for OBC candidates). EDUCATION QUALIFICATION : 10th Class with 50% marks in aggregate from a board of Education recognized by Central/State Government.